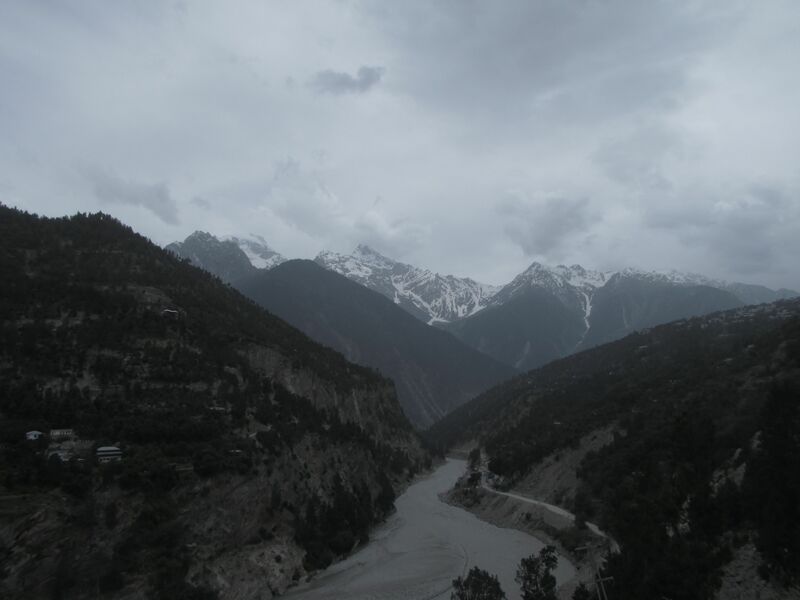 Earlier this year, I decided to embark upon a new adventure – a solo trip to Sikkim! My 15 day journey involved hopping in and out of shared jeeps, switching multiple trains, living in home-stays and budget accommodations, experiencing nature in all its glory, meeting the most amazing people and gorging on the most delicious food! To call the experience exhilarating would be an understatement. I would be lying if I said that I was not apprehensive about travelling alone. But having successfully managed to complete the trip all by myself, I am filled with a sense of liberty and independence! Travelling alone has filled me with a sense of empowerment and also helped me connect with myself in so many ways. I took so many decisions that I never thought I could take, and discovered the courage that I never thought I could possess. Most importantly, travelling alone helped me truly appreciate the significance and culture of the place. Needless to say, I will be writing extensively about my experiences in Sikkim. However, to begin with, I would like to share with you a brief interview that Breakfree Journeys conducted with me to know more about my experience as a female solo-traveller. It gave me a great platform to share (a part of) my experience, apprehensions, preparation and thoughts at the time of travel; And I would love to share it with you! Destination: Hampi, Karnataka Distance: 740km Number of days: 5 Number of travelers: 2 Hampi had been on my travel wish-list for a while. So what better chance could have I got to visit this scenic temple town, other than to relieve some post exam stress? The December-January period felt like a good time to visit (it’s the peak tourist season here) and I was raring to go! 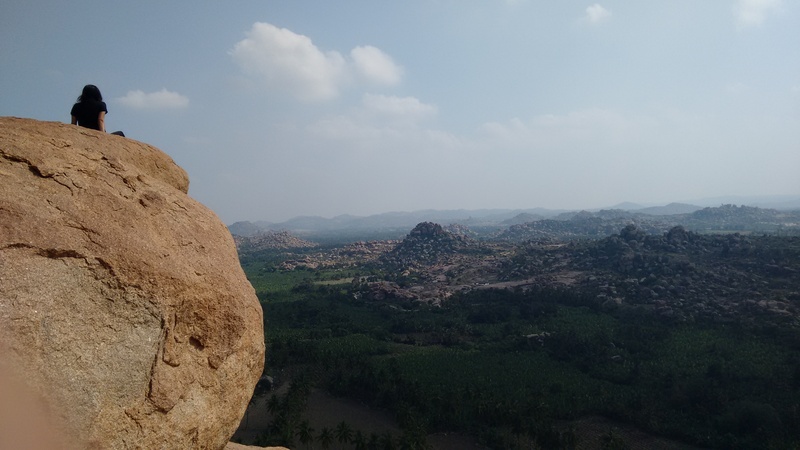 Unfortunately for me, most of my friends had already visited Hampi, which meant that I had nobody to go with. Even as I was gearing myself to make a solo trip (AND convince my parents to let me travel alone), I found a travel-mate in my friend Lizann, who was as kicked about visiting Hampi as I was! After some serious planning, R&D and parent-convincing later, December 29 was fixed as the departure date (yes, this is a late post). Come December 29, and we were ready to hop into our semi-sleeper VRL bus to Hospet (one way tickets cost us around Rs. 1200 per person). VRL is one of the safest and most comfortable means of transport. They have plenty of VRL offices throughout the 727 km Bombay-Hospet stretch, which makes bus-breakdowns and emergencies easy to handle (our bus broke down at around 2am on our way to Hospet, but we were promptly shifted to another VRL bus). We arrived at Hospet by 10.30am on the next day (which was after a delay of approximately 2.5 hrs) and immediately headed to the Hospet bus depot, which is just one street away from teh VRL drop-off point. A number of auto rickshaw drivers (costing Rs. 200 per seat) hounded us, but we were on an economy trip, so decided to take the ST bus to Hampi instead (costing Rs. 15 per person). What caught my attention was the female bus conductor in our ST bus. A true example of gender equality in south India! After a comfortable journey of around 20 minutes (approx 13km from Hospet), there we were! Even as the bus halted outside the Hampi Bazaar area, a chill ran down my spine to actually see the iconic Virupaksha temple that I had only seen on my laptop screen until then! For a few seconds, we were stunned and didn’t know exactly where to go. Soon, we collected ourselves and decided to follow the path to the temple. Our phones were whipped out to call Mr. Bobby, owner of Bobby guest-house, which was recommended to us by Rushikesh – the Man in-charge at Breakfree Journeys (we were indeed an adventurous lot. 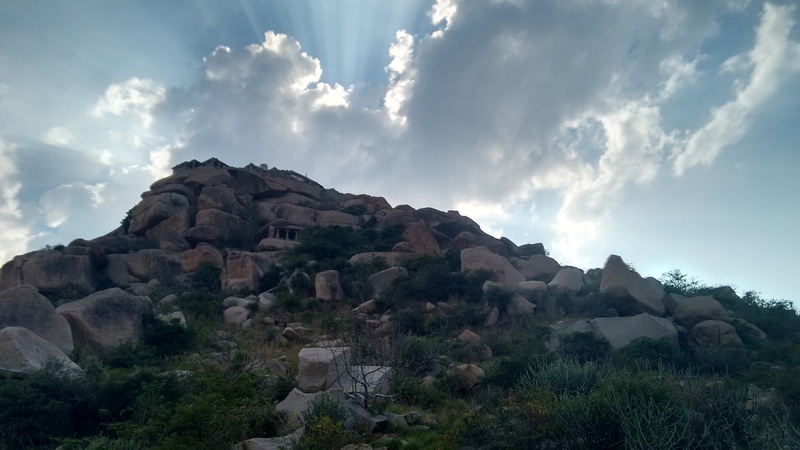 In spite of warnings that it was going to be peak season and finding an accommodation would be difficult, we decided to venture out and find some decent accommodation only after arriving at Hampi). Even as we spoke to Mr. Bobby over the phone, we made our way to the boat to transport us across the river to Virupapur gadde, where most of the guest-houses are located (One way boat-ride costs Rs. 20 per person, extra ticket for luggage. Boat service functions from 7am to 5.30pm. The coracle service starts after 5.30pm, costing Rs. 50 per person one way. Cycles/bikes can also be transported across the river through the boat/coracle). The Virupaksha temple overlooking Krishna river. Bobby guest-house was barely at a minute’s distance from the river bank. Luckily, they had a couple of vacant rooms, so we sorted our accommodation and headed to our room to freshen up (at Rs. 850 per day, we may have shelved out a large amount for accommodation. But we decided to go for it anyway, since it was peak time, and as two female travelers, safety was of prime concern). Soon, we set out to grab a quick bite and explore our side of the river. We bought a map of Hampi from one of the local stores and inquired about cycles. 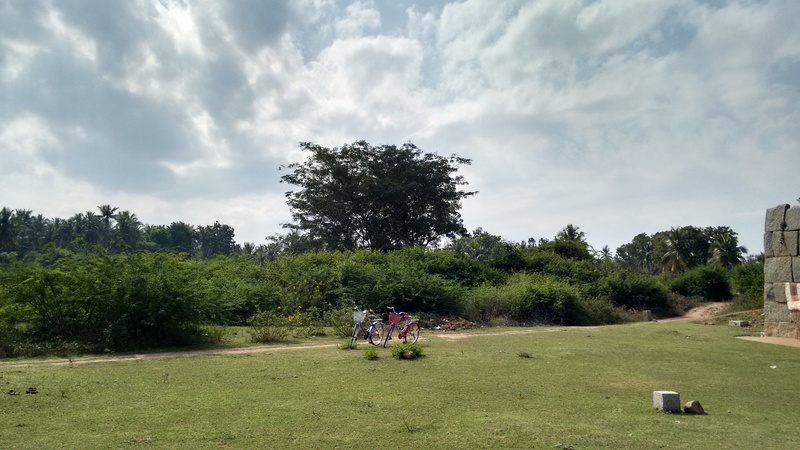 Unfortunately, the all the cycles had been hired out for the day, so we decided to walk it up to Anjaneya hill, in Anegondi village (in retrospection, walking down a nearly empty road is not exactly the safest idea for solo travelers. So do try to get a bike/hire an auto in case the cycles are not available). Dinners were usually simple affairs at Bobby’s and German bakery (delicious desserts at extremely affordable prices). The village area was not very well lit at night, so we preferred to stay indoors and not venture out too far post sunset. View from atop Anjaneya Hill. 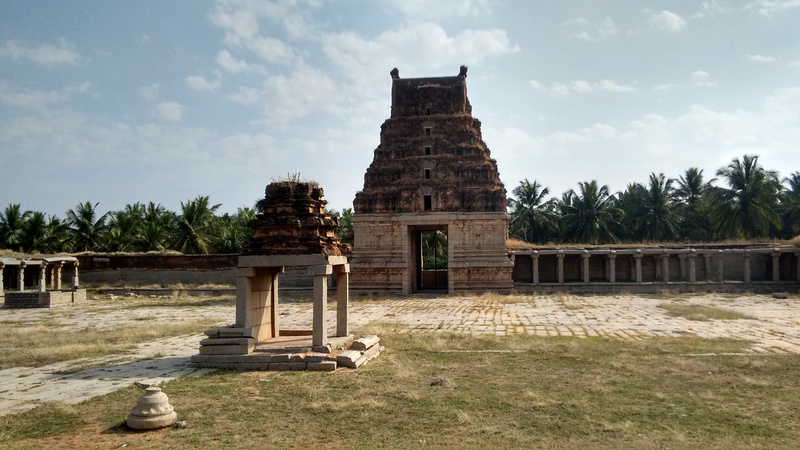 On our second day in Hampi, we decided to do a group cycle tour with a Karnataka State Tourism Department authorised guide, Hanumantha (it cost Rs. 500 per person, including cycle rent. I don’t know if we overpaid, but it was a fairly decent experience). 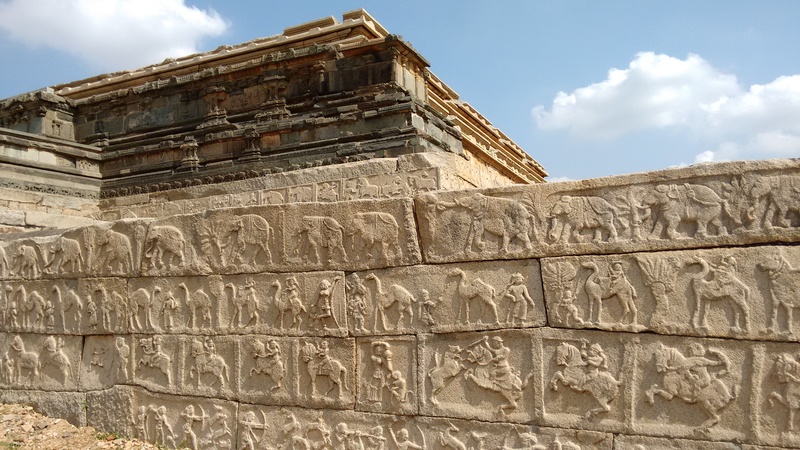 The following places were covered by the tour: Hemakuta Hill, Kadalekalu Ganesh, Sasivekalu Ganesh, Krishna temple, Lakshmi Narasimha temple (which is a brilliant piece of architecture), Badavilinga temple, the Underground Siva temple, Hazararama temple, the Royal enclosure and the Zenana enclosure. The tour ended at the Elephant stables in Zenana enclosure. However, we took the cycles with us and also visited the Queen’s Bath, Mohammaden Watchtower, Band Tower and the Archaeological Museum in Kamalapur. Hanumantha filled us in with stories of the various places that we visited. You can find more information about these places on www.hampi.in. After a tiring, but adventurous day we retired to our room at Bobby’s and geared ourselves for the next day! On our third day in Hampi, we explored the Achyutraya temple ruins, the Monolithic bull, the King’s balance and the iconic Vitthala temple. We covered all these places on foot, as we had to park our cycles in the parking area at the base of the hill. On our way back, we relished some aloo bondas (a local delicacy prepared with potatoes) and sukha bhel. After returning our cycles, we rushed to the river bank so as to not miss the last boat to Bobby’s! A traditional South Indian breakfast comprising of delicious appams and melt-in-your-mouth idlis kick-started day four! We were very keen on visiting the Pattabhirama temple, Jain temples and Mohammad’s tomb in Kamalapur (where the Archaeological Museum is also located). We quickly rented our cycles and set out for Kamalapur. Riding past beautiful banana fields and rice plantations, we reached Kamalapur in about 30 minutes. After seeking some local help with directions, we finally reached Pattabhirama temple. We were very surprised to find no one, except the two of us, in the temple! Excitedly, yet cautiously, we stuck around together to click as many photos as we could! We then headed out to visit the Domed Gateway, which was another place not frequented by tourists. The ride to the gateway was magnificent, to say the least! The banana plantations on either side of the road, the cow-herd walking the cattle home, the fresh air and the empty street made for a beautiful vista! The Domed Gateway was a beautiful and unexplored place, adjoining which was a forest route, which we were craving to explore! Honestly, that was the only time when I wished that I was with a group, for it was very risky for the two of us to cycle through the deserted route by ourselves! A lot of photos later, we made our way out to visit the Jain temples. However, a sari shop on the main road caught our fancy and some major sari (window) shopping later, we were left with no time for anything else. So we made our way to the gushing waters of the Krishna river and freshened up before cycling out of Kamalapur. A part of the Pattabhirama temple. 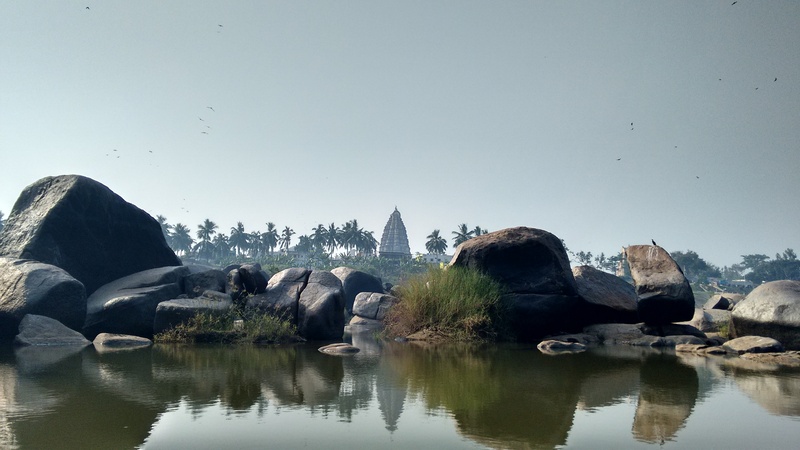 Back at Hampi, we decided to explore the area adjoining the river-crossing. Luckily, we bumped into a couple of local girls who were out on their evening walk and joined them on their way uphill to view the sunset from atop the hill. It was already 7pm by the time we returned to the boat crossing. 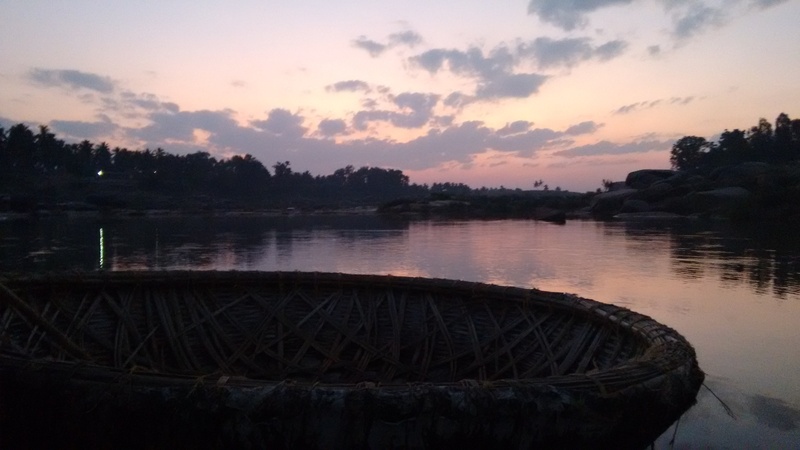 Obviously we missed the last boat, and took the coracle instead (expensive, but yaay). We started our fifth (and last) day with an early morning walk along the river bank. After spending some quality time in solitude, we headed to Matanga Hill. We (rather unknowingly) took the tougher route up, but every bit of the effort we put to climb uphill was completely worth it! 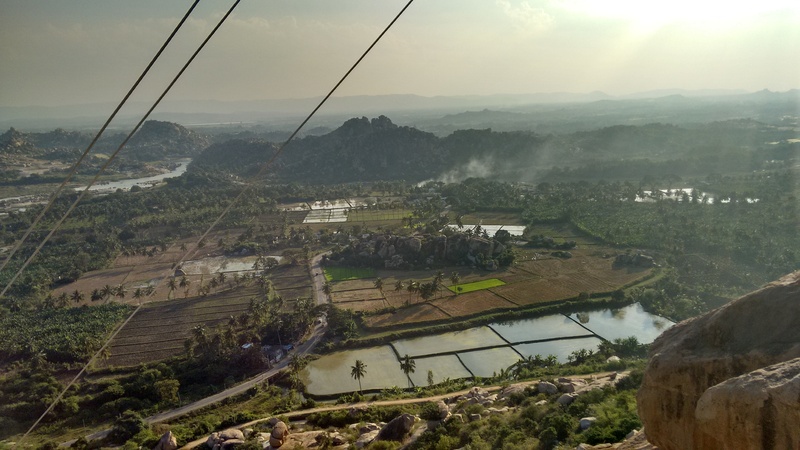 The picturesque aerial view of Hampi more than made up for the toil! One of my favourite moments of the trip: Sitting atop Matanga hill even as the wind brushed across my face. Gazing, awestruck, at the lush green banana plantations, the Achyutraya temple that we had just visited a day back, the Virupaksha temple that stood tall in the distance and a road that ran amid the ruins. Perfect. We soon found our way down through the stairs (the easier route) and decided to grab a quick bite before heading to Virupaksha temple, which is a functional temple. The Virupaksha temple is usually the first stop-point for most tourists, but us being us, we decided to visit it in the end! After spending a good 40 minutes looking around the temple, we headed straight for Bobby’s – from where we collected our luggage – and made our way to the bus stand for a bus to Hospet. A short wait later, we boarded our VRL bus to Mumbai, thus marking the end to our very adventurous visit to the temple town! Sitting atop Matanga Hill. Like a boss! Carry plenty of sunscreen lotion with you at any given time! It is always hot and sunny, and the concept of winter does not exist here. The Virupaksha temple area houses the Karnataka State Tourism Department Office. You could get yourself a detailed map of Hampi from the office to help you with planning your itinerary. It is also recommended to hire the services of a department-authorised guide only, if at all you want a guided tour. Good news for (solo) lady travelers: Hampi is certainly safe for women. However, do remain alert and exercise caution. Personally, I wouldn’t recommend walking around alone after the sun goes down, or in deserted areas, no matter how safe it is. Walking around in groups is always recommended. You can bargain for almost everything! From room rent to yoga mats to shopping in the bazaar to cycle rent. You’ll be surprised at how much you end up saving after all the bargaining. Cycles are available on rent on either side of the river. So you could rent the cycles depending on which of the river you will be exploring (it will save you the cost of transporting your cycles across the river). Most of the guest-houses have a check out time of 10am. If your bus/train departs later in the evening, you can check out of your room by 10am, and request the management to let you keep your luggage in a safe place. Of course, at your own risk, but this works for most! We weren’t very fussy about the food, but there are plenty of options available as far as restaurants are concerned! I won’t make any recommendations here, but will just nudge you to go and explore the well known as well as local food joints with an open mind! But….do try the curd-rice at Mowgli guest-house, if possible. Divine! PS: Thank you Shreedhar (my brother) and Rushikesh for all your help and suggestions! And the sun decided to shower us with blessings even as it set!